Lance Armstrong’s history of lying – ESPN. Wow. Rick Reilly hit’s one out of the park here. I would imagine if I spent more than a decade putting your reputation on the line defending someone I would be pretty upset too. 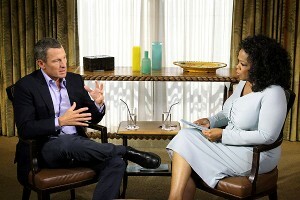 via Lance Armstrong to confess to doping during TV interview with Oprah Winfrey, report says – ESPN « zipsports. Wow. How things change in a just a short amount of time. I was on here last week giving Lance Armstrong credit for finally confessing to his performance enhancing drug use. After reading more and more on the subject, my initial reaction is that Lance Armstrong is a horrible human being. All of the things that I have read about him basically using his power to extort people sounds really sick. I will wait for the Oprah interview to come out, and hear all sides of the argument before I post a final blog on the Lance Armstrong “legacy”. Good video from First Take. I can honestly say for once that I agree with both of them.